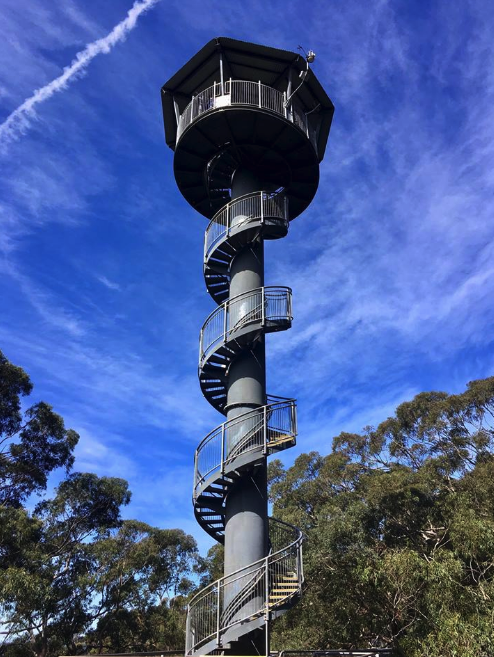 Discover Illawarra Fly Treetop! This award winning Illawarra Fly Treetop Adventures is ideal for an adventurous and outdoor loving people, individual or family. It’s an adventure that can bring you a lasting memory conquering a treetop walk and zipline experience! Illawarra Fly operates the highest zipline tour in Australia, with a series of navigation bridges up to 35m above the forest floor. Those looking to see the stunning Illawarra bushscape from a unique vantage point can head straight to the rainforest canopy. The company runs guided tours and also features a visitor centre and cafe. The Treetop Walk: The 1.5km return walk takes in native rainforest. The steel walkway features two gently swaying cantilevered arms and a central tower raised nearly 50 metres from the forest floor. Positioned 710 metres above sea level, the stunning panoramic views take in everything from the rainforest canopy, coastal towns and out to the Pacific Ocean. The Zipline Tour: Officially the highest zipline tour in Australia, zoom in and experience the Illawarra Fly Zipline Tour as you fly on a series of cable spans and navigate suspension bridges up to 35 metres above the forest floor! Our experienced guides control all departures and arrivals whilst providing you with an insight into the forest’s history and its features with truly unparalleled views. The zipline tour includes access to the Treetop Walk so you can truly immerse yourself in the natural environment. With stunning views, guided tours, zipline tours, a visitor centre and cafe, Illawarra Fly Treetop Adventures is a great day out for families, couples or groups of friends. GRAB THIS DEAL: Illawarra Fly Treetop Adventures!